It’s not often that you get to hear a lecture from a scientist who’s braved death threats just to do his work. But Penn was treated to that unique perspective this past Thursday, when Colin Blakemore delivered this month’s installment of the CNS talk series. Living up to his reputation as one of science’s most influential communicators, Blakemore reviewed the controversial history of animal research and considered what this history says about science’s relationship with the public. He also pointed out lessons for the future of animal testing — what people on both sides of this issue should have learned by now, with years of nastiness behind them. A physiologist and pioneer in cognitive neuroscience, Blakemore became a famed advocate for animal research sort of by accident. In the ’60s and ’70s he conducted research on cortical plasticity, or the brain’s ability to reorganize its functions. His test subjects? Kittens, which most of us know as pets, adornments for Hallmark cards and the stars of fawning videos on YouTube. The experiments involved sewing up these little guys’ eyelids, in ways that proved informative for human vision and contributed to major breakthroughs in our understanding of plasticity. These academic achievements aside, it’s not shocking that the hostility kicked up soon after, in response to Blakemore’s use of precious creatures but also to his frank defense of animal research. What might be shocking is the intensity of the backlash. Blakemore and his family received bomb threats and letters concealing razor blades, and he has been personally assaulted by masked aggressors. All this drove Blakemore to secure police protection for his children for over a decade. Clearly he doesn’t agree with these tactics, or with the opinion that animal testing is just plain wrong. But Blakemore does believe the testing should be openly discussed. In particular, he said, we’ve got to ask: How should scientists and ethicists assess animal experiments? What levels of scientific and medical progress can justify their use? How do we deal with animal suffering? What alternatives have we not yet considered? These questions overlap with issues of public opinion, as it is often individuals outside science who raise the most pointed (if sometimes ill-informed) critiques. On this note, Blakemore called upon scientists to figure out the most effective ways to engage with the public. This is no easy task, given the many contradictions in the public opinion surveys Blakemore reviewed. At least in Britain, people trust scientists much more than they trust the media, and yet they find themselves relying on the media for most of their information about science. Moreover, while they report being impressed by findings from science, they are often suspicious of its motives. Thus part of the challenge lies in educating people without imposing, or even seeming to impose, an aggressive agenda. There has been progress: death threats and grave digging by animal rights extremists appear to have ceased. 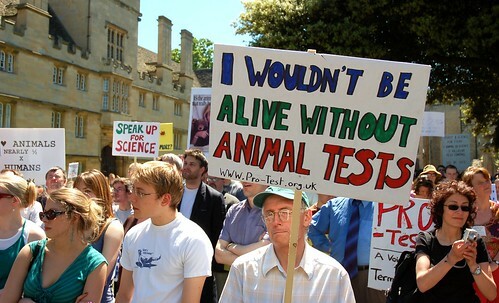 These days, Blakemore is more apt to be caught off guard by protest signs like one he spotted with the declaration, “Vegetarians for animal research.” If that slogan is a sign of the times, then views on animal research have gained some nuance. But of course, in the world of science and ethics, there’s always more work to be done.